Earlier this year, City of Dreams’ The Tasting Room closed its doors for a brief hiatus. After months of anticipation, the new flagship French establishment, and for four years in a row, one of the Top 20 Restaurants title-holder of Hong Kong Tatler’s Best Restaurants Guide, added a five-star rating from Forbes, two Michelin stars and placement on 2017's Asia's 50 Best Restaurants list. In an exciting new chapter, the restaurant has revamped its interior with a new culinary team, headed by renowned French chef Fabrice Vulin, the restaurant’s new head chef. Named Hong Kong Tatler’s Best New Chef for 2015, Vulin boasts With three decades of culinary expertise around the globe. unparalleled prowess in the kitchen, mastering solid techniques in preparing new classics based on highly-seasonal, world-exclusive ingredients from around the world. These rare ingredients, including white caviar by Kaviari of Paris, suppliers of the world’s finest caviar; Gillardeau oysters, named after the French company regarded as the ‘Rolls-Royce of Oysters’, and award winning olive oil from Morocco. These rare ingredients help embellish chef Vulin’s creative signatures, elevating these courses to great heights with Vulin’s imaginative flair. Having honed his craft in restaurants spanning through France, Morocco, Switzerland, and most recently, Hong Kong, Vulin’s presence at The Tasting Room marks an evolution for the exclusive French establishment within the City of Dreams complex. Having reopened the restaurant this summer, chef Vulin presented a refreshing take on French classics through his degustation menu and brand new a la carte selections. Guests can anticipate on rare ingredients, such as the finest of Gillardeau oysters from France, as well as prized beef cuts from the country’s best-known butcher Alexandre Polmard, whose unique aging methods form top quality beef cuts and the finest in quality. The Polmard ‘vintage’ beef has been celebrated around the world since 1846. Traditionally the meat was cryogenically frozen, preserving a remarkable taste of its terroir, a taste exclusively available at The Tasting Room thanks to Vulin’s close relationship with the Polmard family. Polmard’s non-vintage beef cuts, with only two cattle distributed globally to three French chefs on a weekly basis, is a guarantee at The Tasting Room, as the prized tenderloin is well-prepared and featured on the menu by Vulin himself. “I have worked with the Gillardeau family and Alexandre Polmard. For me, it is as much a business relationship as it is a personal one. We develop ideas together and source materials fitting for my dishes,” explained Vulin. “In Europe, we have a clear division of seasons, we have tomatoes, courgettes, aubergines, baby asparagus in the summer. In Autumn, everything changes into mushrooms, particularly the prized truffle, and game meats,” stated Vulin, and it is crucial to work with farmers and fishermen who have first-hand knowledge and experience in these produce. At The Tasting Room, fisheries are often delivered fresh within a three-day period, direct from the boat to the restaurant with thorough communication between chef Vulin and the producers. In a similar fashion, the chef is attuned to seasonal change that affects the produce calendar that affects the quality of the crop, and adjust his menu accordingly. To be in tune with the season, according to Vulin, is as important as a chef as it is to have the skills to prepare the prime ingredients. The revamped The Tasting Room offers a fine dining experience, where guests can take glimpses into chef Vulin’s expertise in preparing his new take on the classics of the French repertoire. Guests are presented with amuse bouche, a miniature tartlet with French salted butter and radish. The paper-thin radish rounds are refreshing and great match with a light dab of butter, melting into the savoury sable crust. A square miniature sandwich of focaccia, made in house, with a filling of Spanish Pata Negra Iberico ham, and black truffle from Tasmania. The ham, like thin, pink ribbons of cured meat, melted on the palate, while the focaccia broke into soft, open crumbs with just the right hint of rosemary lacing through. Poached Brittany lobster, watermelon and yuzu vinaigrette, chef Vulin’s first signature at The Tasting Room, is a winner. The layered first course resembles a slice of pie, where the thin watermelon slice acts as a sweet crust, holding an even spread of lobster flesh and topped with lobster gelee. Dices of green apple bring tartness to cut its richness as well as clean the palate before the next bite. 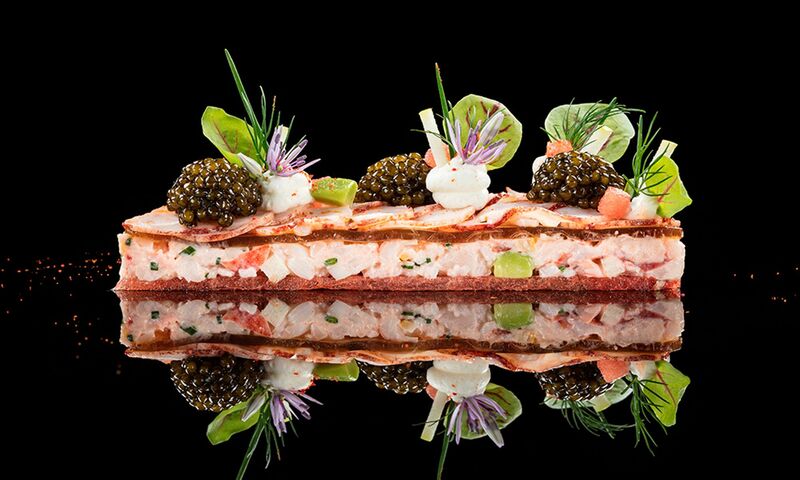 Topped with Kaviari Kristal caviar harvested from farmed sturgeon in China, the miniature caviar pearls melts into the lobster gelee, adding umami to the dish. Vulin’s multicultural culinary career helps him match exotic flavours into his cuisine. In stew "Garbure", capers, cardamom, Blue Mountain coffee, a traditional French stew of ham and cabbage morphs into a grain-rich soup course. Chef Vulin tweaked the dish into a vegetarian version, where a bed of spelt is topped with morsels of turnips, carrots, asparagus, and courgettes. As a sweet broth was poured onto the vegetables, the aroma of cardamom arose, enhancing the intense nuttiness to the Blue Mountain coffee tuile snuggly placed above the vegetable tower. The poached spelt grains kept their chewy texture, while the sharp cardamom enriched the sweetness from the vegetables. The aforementioned Gillardeau oysters are poached and served with lettuce veloute and sea water jelly. The fresh mollusks, only lightly poached, remain creamy with the light herbaceous lettuce soup, and a hint of marine sweetness from the sea water jelly. Similarly, chef Vulin’s simple take on beef tenderloin by Alexandre Polmard, served with red wine jus, wild mushroom tartelette and soufflé potatoes, needs little embellishment, as the aged beef shone through with just the right hint of complexity from the red wine jus. The souffled potatoes add textures that complimented the buttery richness of the beef. Chef Vulin believes simplicity is the key to bring out the best in prime ingredients, as demonstrated in previous courses and especially in his desserts at The Tasting Room. Masterfully building textures in a pre-dessert of strawberry Vacherin, pointy dabs of strawberry meringues, delight the bowl with a strawberry sorbet and topped with the season’s best fraise des bois. The multiple textures rinse the palate of savoury notes, preparing guests for sweets ahead. Guests can indulge in cheeses, particularly rare varieties such as a 48-month aged Comte cheese from renowned fromager Bernard Antony, but there is much room needed for desserts. Vulin’s rendition of the French classic Tarte au citron, or lemon tart, is reinvented into a lemon meringue tart, where the humble citrus turned into multiple textures: an aerated lemon mousseline, lemon meringue piping, a zesty gel, sorbet, and fine juliennes of confit peel, the refreshing lemon is perfectly matched with cooling mint, in chiffonade lining the buttery sable crust of the tart. Chef Vulin’s passion for his cuisine is demonstrated through his solid culinary expertise and a connection to his exclusive ingredients, all reflected course after course at the new The Tasting Room.